In the world of mobility, powerchairs are big business for suppliers and dealers alike. With a global market estimated to reach close to £2billion by 2022 and a domestic private sector boosted the introduction of personal wheelchair budgets, powerchair manufacturers and retailers are working hard to secure their place in the sector and win over customers. Examining the powerchair segment in detail, THIIS investigates what is driving this competitive marketplace, what it takes to be a successful powerchair dealer, and what the future holds for those operating in the sector. With more choice in the domestic market than ever before, suppliers are busy working on trend-setting devices to grab retailers’ and end-users’ attention. All this choice however, can make it difficult for retailers to decide which products are worth their time and money. Amongst all players in the market however, there are two elements widely acknowledged by retailers and suppliers as being fundamental when selling powerchairs. According to key retailers and manufacturers, product and service quality are always at the heart of any successful powerchair operation, with the two going hand-in-hand. In a market with large, established players and disruptive new entrants, there is little room for a product lacking in quality, with dealers and customers not short on alternative options should one fail to deliver. It is a point upheld by TGA’s National Sales Manager Tim Ross, who told THIIS that comfort, postural support and particularly product reliability continue to be major considerations in end-users’ buying decisions. Beyond demands for the right product, suppliers and retailers note that customers demand the right level of service, be that in terms of supporting marketing materials, staff knowledge and aftersales support. Selling to both end-users and the trade, specialist powerchair provider Precision Rehab’s Director Matthew James described that first and foremost, end-users are looking for dealers that know the market inside out. “The most important thing that end-users are looking for is a professional and understanding service from start to finish,” he said. For dealers to provide this high level of service desired by customers, the obligation is on suppliers to supply the necessary levels of support to their retail network, with high levels of supplier support being as crucial as high-quality products to encourage retailers to promote and sell a product. A founding partner of lightweight wheelchair, powerchair and seating solution specialist Motus Medical, Chris Taylor stated that above all else, service support is what separates good suppliers from bad suppliers and largely determines which products his company will work with. “Most importantly, it’s the backup we get from suppliers on spares and support on problem solving that really matters,” he said. This importance for service has not gone unnoticed by suppliers in the industry, with Karma’s General Manager Mark Duffield pointing out that the company invests in a large stock of spare parts and accessories to ensure it can meet the rapid response required by dealers for their customers. With a market growing more constantly more competitive, suppliers continue to hunt for new ways to distinguish themselves in the market through technological advancements, with chairs becoming all the more complex. For dealers, this means continuously training service engineers to be able to work with these more intricate and complicated devices in order to meet the exceptional service demanded by the market. “I think Personal Wheelchair Budgets might open the market up for retailers and suppliers to market our products to a wider audience” Mark Duffield. It is one of the driving forces behind suppliers in the market investing heavily in their training offer to dealers. Invacare and TGA also emphasised that training was one of the cornerstones of their dealer offer, with TGA’s Tim Ross explaining that the company ensures its dealer network has access and regular communication with the company’s technical staff. “TGA helps dealers to achieve servicing excellence through regular updates to engineers and technicians so maintenance and repairs can be completed proficiently,” he stated. With only so many hours in a day and so many days in a week however, there is a growing likelihood that dealers will specialise their complex powerchair offering, adopting a similar structure to that of Motus Medical, working with a limited number of key suppliers. It has led to some suppliers investing in new technology to benefit not only end-users but dealers as well. One such example is Quantum’s new Interactive Assist app, allowing dealers’ service engineers to access a chair’s diagnostic data remotely. As competition and technological developments expand, it may well be those suppliers that make life easier for burdened dealers that may see the most success with their retail network. How are suppliers differentiating in the market? With the need to differentiate in a fiercely competitive market, there is a growing need for suppliers to add more unique selling points to their powerchairs, with a raft of new features appearing in the market over the years. With end-users living more interconnected lives and more everyday technology talking with each other, the same is expected from modern powerchairs. With apps that allow dealers and retailers more access to the devices – such as Quantum’s new Interactive Assist technology for dealers and TGA’s WHILL C’s ability for users to move the device using their smartphones – some powerchairs are challenging the product’s older associations with disability, with some positioning themselves as modern, high-tech innovations. “If effective technology and appealing design are successfully leveraged, any historic stigmatism can be lost as assistive products are accepted more in society,” claimed Tim Ross. Continuing with the idea of aesthetics, TGA Mobility’s National Sales Manager maintained customers are looking beyond functionality, prioritising style along with substance. “End-users are becoming more style conscious and hence seeking powerchairs that look good as well as deliver effective mobility”, he commented. It is a point emphasised by many in the industry, with specialist wheelchair dealer Motus Medical’s Chris Taylor explaining that one of the foundations of his company’s success is it engineering department’s use cutting edge moulding technology to adapt shapes for clients. “These days, it’s all about customising the chairs,” he stressed. Simon Tempest shared the view, noting that customers are increasingly expecting more freedom to tailor the chair to suit their own sense of individuality. Whilst the technical development of powerchairs for complex disabilities continues to rise, one of the quickest growing areas in the powerchair market is the rising demand for lighter weight and more compact chairs. Often designed for and marketed at those with less complex needs, Karma’s Mark Duffield noted: “Some users are looking for a light model to lift in and out of the car, others might need a compact chair to hoist into the car,” he observed. Shining a light on this increasing demand for lighter weight options, TGA’s Tim Ross said: “Designs that are transportable continue to grow in popularity as individuals want to travel further afield, nationally and internationally. 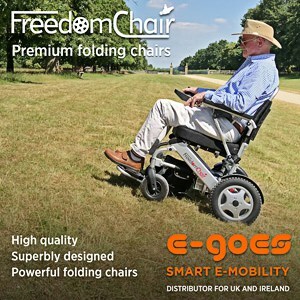 This demand for lighter, more compact chairs has seen new entrants such as e-goes JoyRider powerchair and Motion Healthcare’s Foldalite enter the powerchair arena and proving popular with dealers looking to extend their powerchair portfolio for end-users who may be just need additional mobility support, rather than having a complex requirement. Alongside lighter weight, manoeuvrability is another feature used by suppliers to differentiate their products on the market and is largely in response to the more restricted spaces users are using the devices in, according to TGA’s Tim Ross. “In terms of manoeuvrability, powerchairs need to be able to cope within reduced space these days as properties become smaller and pedestrian numbers increase,” he commented. Manoeuvrability is one of the key elements TGA highlights relating to its WHILL C powerchair, boasting a unique wheel system that allows for a very tight turning circle. TGA are not the only company to emphasise manoeuvrability however, with Ottobock’s Stuart Wheatley also making the case for the manufacturers’ latest range. “Combining the convenience and manoeuvrability of a mid-wheel drive powerchair with the outdoor performance of a rear-wheel drive version has been a conundrum for manufacturers for many years,” he said. With an increasingly ageing population and with more CCGs introducing Personal Wheelchair Budgets throughout 2019, demand in the private market is only expected to rise in the years to come, making powerchairs an attractive product area for dealers. For dealers that may have only sold mobility scooters in the past or operate strictly online-only business models however, Tim Ross cautioned that the requirements to retail powerchairs effectively are different. “When supplying powerchairs, face-to-face assessment is 100 percent essential. The needs of each potential customer must be thoroughly checked to ensure the right product and adaptations are supplied – hence resulting in maximised independence,” advised Tim. Additionally, Tim says a structured assessment process, combined with actively listening to an end-user, will result in a better outcome for end-users. For dealers interested in selling powerchairs, Precision Rehab’s Matthew James elaborated that to carry out assessments, staff need to about the products and the disabilities they are likely to encounter. “There are many things that retailers need to have in place to effectively prescribe powerchairs, however, we feel the most important are the fast, effect aftersales care; parts in stock; and experienced assessors that know their products inside and out,” stressed Matthew. Discussing the process of assessments in more detail, Motus Medical’s Chris Taylor told THIIS how his team of powerchair experts work with end-users to identify the right chair for their needs. “It’s really all about our employees and their passion for finding technology to match client needs and demands,” described Chris. The importance of providing assessment for customers is echoed by Karma’s Mark Duffield, who pointed out that for powerchair dealers, having the skill to assess and the facility to service are two valuable aspects for a successful powerchair dealer. “The ability to assess and identify the right product for a user is vital,” he explained. Backing up Mark’s point, Ottobock’s Stuart also discussed the advantages afforded to dealers that have the space to offer end-users a range of options, however, pointed out that a physical space is not a prerequisite to being an effective powerchair dealer. “It is important customers can see the products they are interested in, so it is important retailers have plenty of options on display, together with supporting marketing material so the customer can make an informed choice on what’s right for them,” underlined Stuart. “And as mentioned before, it is vital retailers have comprehensive knowledge of the products so they can answer any questions a customer may have. For specialist powerchair dealers Motus Medical and Precision Rehab, both emphasised that their business models do not rely on physical showrooms, noting that suitability for an end-user is best established by having them use their chairs in the environments they will be used in on a daily basis. The point was echoed by Precision Rehab’s Matthew James, adding: “We do not believe a showroom is always necessary as any client will need to try the powerchair in the environment in which they will be using it. This is vital to ensure the powerchair works where it needs to, be at home, at their workplace, in their vehicle (either as a passenger or driver), along with being suitable for any hobbies and interests the user may have. One of the biggest opportunities in the private market for both manufacturers and dealers alike is the continued spread of Personal Wheelchair Budgets, with CCGs up and down the country adopting and rolling out the scheme designed to provide end-users with a greater say in the powerchairs they choose. “I can only see this as a benefit to both the dealer market and the end users as it’s freedom of choice, what could be better than that?” said Motus Medical’s Chris Taylor. The mobility dealer’s optimism was shared by all players THIIS spoke with, encouraged by the idea of more end-users engaging with the private market. “I think Personal Wheelchair Budgets might open the market up for retailers and suppliers to market our products to a wider audience,” reaffirmed Karma’s Mark Duffield. His hopes were echoed by Ottobock’s Stuart Wheatley, with the Head of Human Mobility noting that Personal Wheelchair Budgets will enable users the opportunity to access features sometimes previously unavailable to them through the NHS. “I believe personal wheelchair budgets could have a positive effect on the market when individuals may have unmet needs. An example would be when a seat riser option is used on a power wheelchair for reaching high cupboards or transferring to different seat surfaces,” he explained. With a market already experiencing fierce competition and an influx of new, discerning customers with the freedom of choice at their fingertips, it is likely that the pace of innovation will only quicken as suppliers seek new ways to distinguish themselves in an increasingly saturated segment. “As end users obtain greater control of their own budgets, we believe there will be a demand for more choice within the market,” suggested TGA’s Tim Ross. The National Sales Manager for TGA went on to say that whilst price will remain a major factor in end-users’ decision-making process, customers are often willing to spend more to get the right chair for themselves, whilst popular leasing schemes such as Motability will continue to provide customers with an alternative to private ownership. Trust and loyalty are two factors more prevalent in mobility than in many other markets, with mobility products and powerchairs in particular playing a vital role in the quality of an end-user’s life. Market research carried out by Nielsen in 2016 found that disabled consumers are more loyal to brands than almost any other consumer group, with a consultant from AdWeek highlighting that disabled consumers are more likely to be advocates for the businesses and brands that they love because they are hungry for products that work for them. This loyalty is largely driven by the high-degree of trust afforded to brands of powerchairs by end-users, who rely on the devices to fulfil one of the most important facets of their lives, their mobility. Suppliers and retailers that do a good job are rewarded by end-users who are more likely to sing a products’ or business’ praises to friends and family, spreading awareness through valuable word-of-month recommendations. For competitors, trying to entice consumers away from brands they are loyal to is a difficult task, hence the importance of being first to establish brand loyalty with end-users. It has led to a significant investment in marketing by key players keen to raise brand and product awareness of their products amongst both end-users and retailers in the market. Whilst often not selling to end-users, powerchair suppliers can often be found at shows and exhibitions across the UK throughout the year, whilst TGA’s recent regional Retailer Roadshow reflects its desire to get in front of dealers face-to-face. “TGA’s trade programme includes free outreach roadshows, marketing, PR and point of sale – all aimed at supporting powerchair sales for dealers,” commented TGA’s Tim Ross. With a potentially new, untapped customer base soon to enter the private market through Personal Wheelchair Budgets, alongside the ever-popular Motability scheme, marketing and advertising in the industry is likely to see as much growth as product innovation. For manufacturers and retailers, establishing loyalty with customers early on is vital to avoid having to try and attempt to sway committed consumers away from their favourite brands and dealers further down the line. With a population that continues to age, a national personal budget initiative encouraging end-users to consider buying privately, and an extremely loyal customer base, it is no surprise that the powerchair market is one of the most hotly contested areas of mobility. It is a market not without its challenges however, with TGA’s Tim Ross indicating that as supplier and retailer competition increases, ensuring end-users are not taken advantage of becomes all the more crucial. “One of the main challenges will always be signposting people to the right powerchair supplier. It is essential that accurate and objective information is available, particularly online, that helps individuals make an informed decision,” cautioned Tim. “Customers need to be in control of the purchasing process and to be able to talk to specialists with genuine expertise – not pushed into buying a product that only suits the dealer. In the more immediate future, Brexit concerns could spell trouble for suppliers and dealers in the industry, particularly in relation to quick access to vitally important spares needed for servicing and new chairs to meet growing demand. Distributing the Paravan range of powerchairs from Germany, Precision Rehab’s Matthew James discussed what effect Brexit could play on his company: “As most of the Brexit agreement is unknown, it is a hard question to answer, however, we predict it will slow our delivery times from the EU by around 2 weeks and increase the amount of administration dealing with import paperwork required for customs clearance and duties. Whilst Brexit is often spoken of as the troll lurking under the bridge for many UK businesses, Karma’s Mark stated that it is the level of competition in the UK market that is the real challenge for suppliers, stressing the need to stay one step ahead with innovation. “Competition is the biggest challenge but fortunately Karma are constantly striving to improve their products and designs to satisfy demand, so they’re a great supplier to work with,” he remarked. Despite the challenges ahead, players in the market remain largely optimistic and those that continue to prioritise the two core foundations of product quality and service quality will be well-placed to reap the rewards on offer in the expanding powerchair market. A dealer’s perspective: What powerchair features are customers after? Describing what he feels are the most important features for his customers, Chris Taylor, Founding Partner of Motus Medical, told THIIS: “Our clients are more on the side of technology that matches their lifestyle needs and its ability to empower them; that’s our challenge. Selling specialist powered wheelchairs through both a direct sales channel and a dealer network, Matthew James, Director of Precision Rehab, explained which powerchair features are proving popular: “The most in demand features or functions are electric seat lift (with low floor to seat height) and electric tilt in space for pressure relief. One of the most attractive aspects of selling powerchairs and scooters for retailers is the opportunity to cross-sell add-ons for the devices, with no shortage of accessories in the market for retailers to consider stocking. Supplying the mobility retail market for over 15 years, THIIS asked Able2’s Chris Houlker which five powerchair accessories are proving most popular. This strong durable bag is ideal for most powerchairs and scooters with or without a headrest. There are two side sleeves to place crutches or walking sticks in and it has one main compartment, a small zipped front pocket and a front net pocket. Available in black and grey, there is also a reflective strip for safety. This universal size cape is designed for chairs with electronic joystick controls on the left or right side. The cape covers the user and the chair. A clear panel ensures that the chair’s controls can be seen by the user. A brushed cotton lining provides additional warmth. Available in two sizes, this lightweight cover slips over your scooter when protection from the elements is needed. The waterproof fabric has sealed seams to eliminate water penetration. Fits most three and four wheeled scooters. This effective wrap around control panel cover prevents rain from getting into the scooter controls. It fits most styles of scooters and the elasticated edges provide a snug fit. Available in two sizes, this practical, fully zipped hooded cape will cover the user and the scooter. A clear panel at the front allows the lights to be visible, plus the user can see their control panel instruments. Slots at the side allow wing mirrors to sit outside the garment.